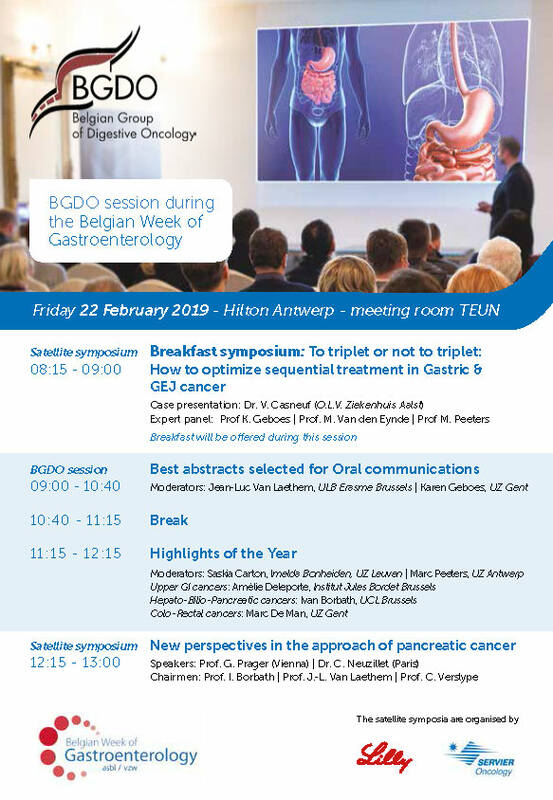 The BGDO is pleased to invite you for the next Digestive Oncology Course for clinicians. Due to rapid technical advances, steeply declining sequencing costs, and the ever-increasing number of targeted therapies, it can be expected that extensive tumor sequencing such as whole-exome and whole-genome sequencing will soon be applied in standard care. However, the complexity of interpreting genomic data is hindering its implementation in the clinical context. This course aims at making clinicians familiar with the types of genomic variants reported by the laboratory and the technology used to determine the results, including limitations of current testing methodologies and reports. A special emphasis is put on the main molecular alterations in gastro-intestinal cancer and the direct perspectives for targeted therapies. 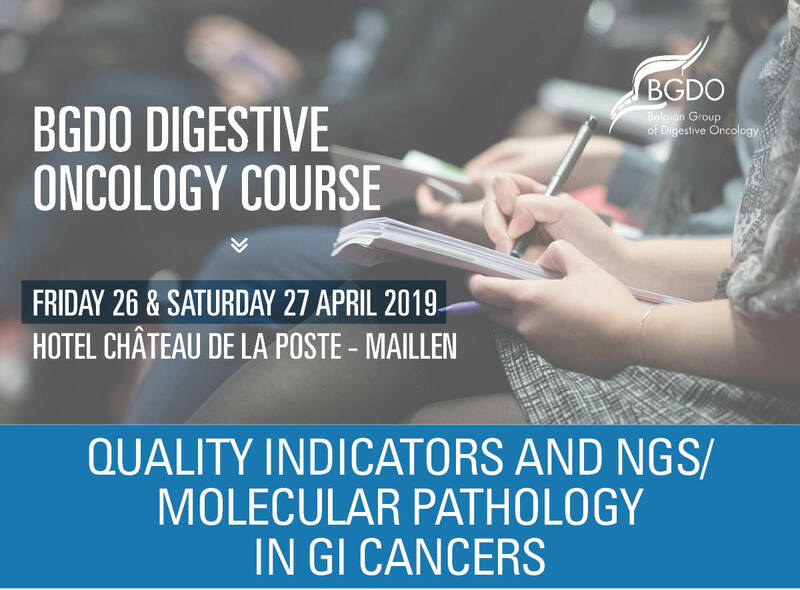 This course applies to clinicians interested in digestive oncology, but without profound knowledge of recent progression in molecular biology. On Friday evening a barbecue is foreseen in an hunting lodge. We will eat in the forest around a nice fire. Philippe AFTIMOS, Institut Bordet Brussels / Kathleen CLAES, UGent / Karin DAHAN, IPG Gosselies / Jeroen DEKERVEL, UZ Leuven / Nicky D’HAENE, ULB Erasme / Karen GEBOES UZ Gent / Vincent HAUFROID, UCL Brussels / Patrick PAUWELS, UZ Antwerpen / Hans PRENEN, UZ Antwerpen / Sabine TEJPAR, UZ Leuven / Isabelle VANDEN BEMPT, UZ Leuven / Marc VAN DEN BULCKE, Cancer Centre Sciensano / Liesbet VAN EYCKEN, Cancer Registry. 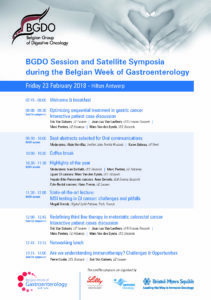 We are glad to announce the 15th BGDO Annual Scientific Meeting. Curative approach in oesophageal cancer and peritoneal carcinomatosis are the main themes of this year. The meeting will explore original and interesting topics on ADJUVANT THERAPY: TODAY & TOMORROW. First, we will start with the General Assembly. A good opportunity to have short glimpse on the new website, the achieved goals, the new collaboration with the FFCD and an update on the ongoing and upcoming trials. Prof Laurent-Puig addresses the value of Liquid Biopsy in GI cancers, a very hot topic in the near future! Another underused practice to improve survival is to follow patient care through Patient-Reported Outcomes (PRO). Prof Marc Peeterswill comment the engaging results that can be obtained by interacting with patients more closely. The IDEA consortium looked at the role of the length of adjuvant chemotherapy in colorectal cancer. Prof Timothy Iveson led the SCOT trial with very interesting results in this setting and will give us the privilege to listen to his analysis. In gastric cancer, the FLOT trial sets a new standard in perioperative care, which will be presented by Prof Alain Hendlisz. Prof Chris Verslype will discuss the value of capecitabine in hard-to-treat pancreatic and biliary tract cancers. Last but not least Prof Marc Buyse, world-renowned statistician in the field of oncology, will propose new ways to address clinical trial design, benefit assessment and futuristic statistical methods. A huge thank you to all our Sponsors, Majors and Regulars.